Fever, headache, intense weakness, joint and muscle pains, and sore throat; this is followed by vomiting, diarrhea, stomach pain, rash, impaired kidney and liver function, and in some cases, both internal and external bleeding; sometimes, rash, red eyes, hiccups, and bleeding from body openings may be seen in some patients. The DOH advised suspected cases to be taken immediately to the nearest health facility for medical attention. Severe cases require intensive supportive care. At present, there is no specific treatment or vaccine yet available. According to Health Chief Enrique Ona, the most at risk to contract Ebola infection are health care workers and laboratory workers who may be exposed to secretions and specimens from infected individuals. Family members and those in close contact with those who are sick can also become infected. wash hands after visiting sick relatives in the hospital and after taking care of ill patients at home. 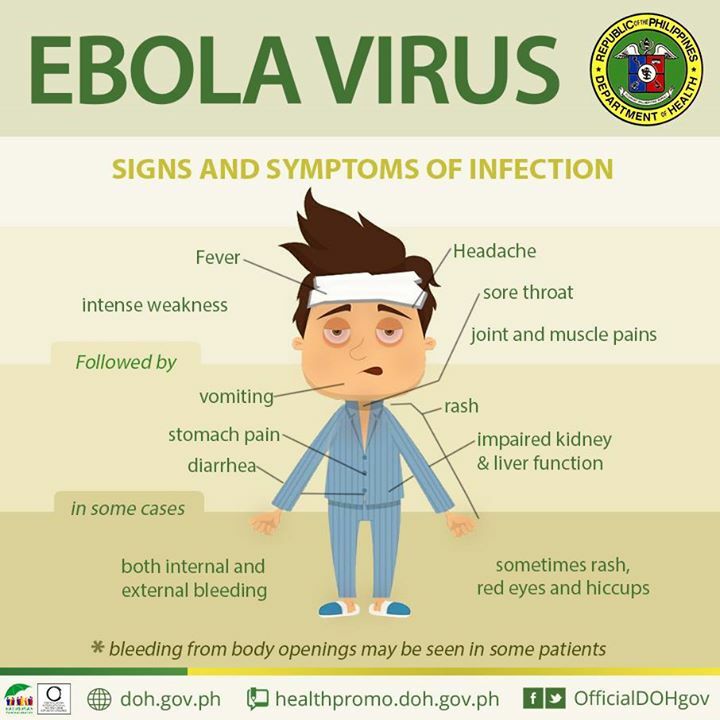 This entry was posted in Diseases, Health Advisory and tagged ebola infographic, ebola virus, what is ebola virus, what we need to know about ebola on August 3, 2014 by Yami.